We have 60 liquid mixers and eight liquid bottling lines to fulfill all of your liquid blending needs. We have four powder mixers capable of blending up to 7,000 pounds, including ribbon and paddle blenders. We can efficiently package your product in virtually any size from eight ounces to rail cars. 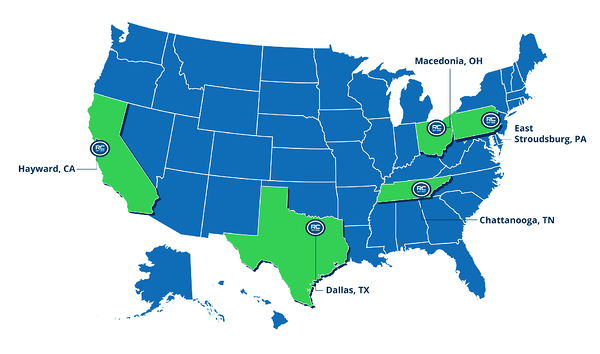 Our five plants reach 83% of the U.S. population with 1 day shipping. We have 250,000 sq. ft. of heated warehouse space to serve you. Our plants not only handle all inventory and operations, but we have a 99 percent on-time and complete production record, and same day shipping for stocked materials. Our strategically located plants allow us to meet your custom chemical needs. I&I cleaning is our specialty and we can play a role in creating solutions for laundry to food processing to disinfectants. We offer solutions to those who clean, treat and process the metals that global industries rely on every day. We help our partners blend, store, package and ship the chemicals that support our nation’s oil and gas industries. We can provide water treatment solutions for municipal, remediation and boiler & cooling tower customers. We continue to play an important role in improving the quality and yields of America’s farmers. Wherever you are in the product life cycle, Royal Chemical may be able to provide a customized solution for you.